My mother used to sing to her children. There were quite a few of us (I was number 9 of 13). Singing was one of her tools for getting the herd to settle down at night and to give her a little peace and quiet. It wasn’t just nursery rhymes or lullabies, but just what ever song she felt like singing. Funny that the only one that I really remember is “just a wee deoch an doris,” not hardly a song that most Moms would choose to sing the kids to sleep with (particularly in a Mormon household). I always assumed that ALL mothers sang their babies to sleep. I’m learning that this, sadly, is probably not the case. It had not occurred to me until recently that this evening ritual is probably the reason that I’m so moved by female vocalists. My Wife Cindy just seems to assume that I’ve developed some strange crush on this singer or that, but I think that it really comes down to hearing the pleasing tones that Mom used to lull us all off to sleep after a rough and tumble day. Some female vocalists just hit a pitch or a sound that creates a significant peace in my mind. 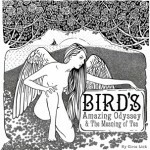 Keeping in mind that Mom was singing to children, I believe that she has a tendency to focus on the upper range to pander to us kids, which quite possibly is the reason that Circe Link and Christian Nesmith’s latest release “Bird’s Amazing Odyssey & The Meaning of Tea” sits so well with me. This CD is a concept album. The songs weave a story that is best heard the first time listening from track 1 to track 11, without skipping songs. It is about weighing the risk of moving forward with life changing decisions. This is not a dark album (Well, there is one reference to Sylvia Plath). It is as light and fun as a bird. Circe’s sweet voice fits perfectly in telling this story. 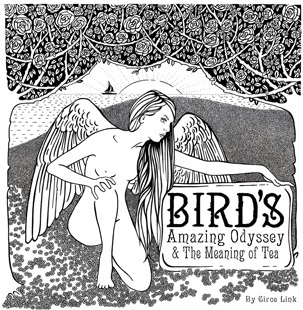 Circe starts on the first track, “Caged Bird” telling about choosing to leave the palace to venture into the world, about forethought and research. Listening to this song you can just see a songbird explaining its actions to the audience. This could easily be a kid’s CD, but it is not. The songs are far too good for kids who don’t yet see the meaning of the songs (although I could easily imagine Mom singing any of these to me). Circe does all of the vocals on this album, overdubbing the harmonies every bit as sweetly as Mary Ford. Her harmonies seem to be a reincarnation of The Andrews Sisters. Christian and Circe do all of the instruments, with Christian doing the audio mixing and production. This is obviously a labor of love by these two wonderfully talented performers. Circe and Christian do music that does not seem to be definable by the common genre. It isn’t pop, it isn’t country, it isn’t rock. The only term that I have been able to get to fit is “just Fun.” Their music really is fun, to listen to and to watch. Do yourself a favor, go to Christian and Circe’s Band Camp page and listen to the entire album. You can stream all of the songs from the Band Camp link. If you enjoy it as much as I did, support the artists by buying a copy. That’s how we keep talent like Circe and Christian writing new and fun music.